Why do legal documents like terms of service agreements often include all caps? 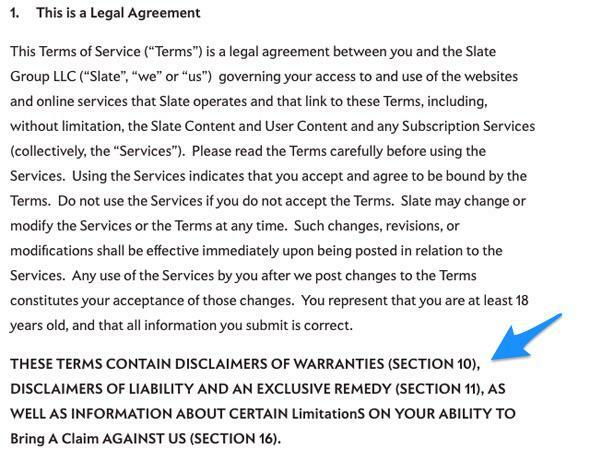 Why Are the Terms of Service Agreements We Never Read in All Caps? We all have quiet nights at home where we sit with a cup of tea and go through the Terms of Service agreements for the software and websites we use. Right? OK, yeah, no. But even if you’ve never read a ToS in your life, you do know one thing about them: They basically always include sections that are in all caps. BUT WHY? It all starts with the idea of “conspicuous” text—using formatting or typography to call attention to certain parts of a legal document so they’re harder to miss. Many laws and statutes have requirements for what needs to be “conspicuous,” and certain provisions of contracts, like limitation of liability and disclaimers, are frequently capitalized to make them conspicuous. So written, displayed, or presented that a reasonable person … ought to have noticed it. Whether a term is “conspicuous” or not is a decision for the court. Conspicuous terms include the following: (A) a heading in capitals equal to or greater in size than the surrounding text, or in contrasting type, font, or color to the surrounding text of the same or lesser size; and (B) language in the body of a record or display in larger type than the surrounding text, or in contrasting type, font, or color to the surrounding text of the same size, or set off from surrounding text of the same size by symbols or other marks that call attention to the language. The crucial takeaway here is that the styling for conspicuous text doesn’t always have to be all caps. For a commercial contract, it could be something a lot more appealing that doesn’t make you feel like your new favorite social network is yelling at you. But some documents are reproduced for decades from boilerplate versions, so the caps get passed down through convention. There are also some laws and statutes (especially at the state level) that explicitly call for all caps in certain sections. Capitalism is always a good explanation for nonsensical intransigence, as is devotion to convention in law. But change is possible. In Typography for Lawyers, Matthew Butterick writes, “All-caps text —mean­ing text with all the let­ters cap­i­tal­ized—is best used spar­ingly. That doesn’t mean you shouldn’t use caps. Just use them judi­ciously.” Lawyers for tech companies, take note.